For the second time, I have graded all the legislators in the Delaware General Assembly based on their voting patterns on a number of key issues. The final product can be found in its usual sidebar location, or right here. One new feature because Delaware has staggered elections is an indicator of whether the legislator is running for another term, and if so what sort of opposition he or she faces. Some have a free ride through the primary, while a select few have no general election opponent. Without getting too much into it – after all, I want my friends in the First State to read and share the information – it was another discouraging session for the Delaware General Assembly. But even the darkest sky has a few stars in it, and one shone very brightly as a beacon of conservatism. The 25 votes I used were split with nine being dealt with in 2017 and 16 having final action this year. At least one of these bills took nearly the full two sessions to be finalized, but most of them came along earlier this year. In truth, I had the tallying completed several weeks ago but, like in Maryland, I had to wait for the prescribed post-session signing deadline to come and go. It’s my understanding that bills not signed within thirty days of the end of the second-year Delaware legislative session are pocket vetoed, and two of the mAP – DE bills were in that category. By my count, thirty days (excluding Sundays) from the end of session fell on this past Saturday: hopefully I won’t have quick editing to do. And if you were sharp-eyed last night, you would have noticed I did the usual “soft opening” by updating the widget before this post was finished and set to be placed up at this early hour. So, Delaware, here is the voting guide you need this fall – use it wisely. If you’ve been keeping up with my infrequent musings of late (admittedly, it’s not hard to do) you’ll probably know that I’ve been keeping an eye on the struggle to bring common-sense, job-creating right-to-work legislation to Delaware – as has the national internet site The Daily Signal. On that front I bring you some good news and some bad news: first, the bad news. As a prospective resident of Sussex County, I was dismayed to find out that the County Council there is four shades of gutless. That represents the four County Council members who let the vague threat of lawfare scare them into rejecting a bid to make the county the first in the state and region to become a right-to-work county. Only Rob Arlett, who represents District 5 – a district that takes in much of the southern third of the county, including Delmar, Millsboro, and Fenwick, but not Laurel – voted for the measure he sponsored. Granted, the ink wouldn’t have been dry on the ordinance before Big Labor found a friendly judge to slap a TRO on it (and that would have been done out of Wilmington or Philadelphia, since there’s not a ton of union presence in Sussex County) but it also would have allowed a second circuit to rule on the law, just as the Sixth Circuit Court of Appeals that covers Kentucky ruled favorably on a county-level law there. (Later, the entire state adopted right-to-work legislation.) Since Delaware is in the Third Circuit and it’s fairly dominated by Democrat appointees, it’s likely they would have ignored the Tenth Amendment and found some excuse to thwart the county’s will. (Bear in mind that the County Council didn’t seem to object on the aims of the law but only the fact it would create a legal hassle.) Yet once two circuits come to a split decision, the next step is the SCOTUS and maybe this is a good time for them to decide on it. So it was left to the town of Seaford to accomplish what their larger governmental unit could not, approving a right-to-work ordinance in December that was announced today. Good for them, and that was definitely good news. And it may well be good for them. The timing was probably coincidental, but it was also announced today that a former industrial plant in the city would be getting new life as an intermodal rail and truck facility. So if you figure there’s going to be needed renovations that create construction jobs as well as a handful of jobs for distributing the freight from railcar to tractor-trailer and vice versa, that could be the difference between sitting at home making a wage of zero and working for someone making a reasonably decent wage. It could even be a union shop, with the key difference being that not everyone would be forced to join or pay dues. Here’s the thing. What unions seem to be most afraid of isn’t the fact that they would have to compete and sell new workers on the benefits of joining, but the prospective loss of political power they would suffer if the number of dues-paying members drops off. Wisconsin is a good example of this: the unions’ dues-paying rolls are off 40 percent since right-to-work legislation passed in 2011. Assuming the Seaford measure isn’t taken to court, which it probably will be for the reasons stated above, perhaps more businesses can help boost Seaford’s bottom line. Unlike a lot of other similar-sized towns, they have the slight advantage of having infrastructure for growth already in place thanks to a number of shuttered or underutilized industrial sites left over from the days it was the “nylon capital of the world.” I’m sure they don’t care if they get back to making nylon, or even if they’re the capital of anything – they just want to thrive. While Big Labor may beg to differ, even the average union guy on the street knows the true minimum wage is zero. And in an area that cries out for good-paying jobs, why not make yourself as attractive as possible to secure them? So here I am, just thumbing through my e-mail for the day, and I find this on the Daily Signal website. I would quibble enough to say that Delaware isn’t really part of the Northeast – particularly Sussex County, although many who have arrived there in recent years hail from the states commonly considered the Northeast – but the prospect of a right-to-work law in the heart of Delmarva could be enough to get a second look from prospective employers. I have a little bit of knowledge about the way Sussex County’s economy works as an erstwhile employee of one of their leading homebuilders. The eastern half of the county, basically from U.S. 113 to the beach but mainly close to Coastal Highway (Delaware Route 1) is booming with new developments, primarily homes that are purchased by retirees from nearby states who sell their $500,000 houses there and buy a $350,000 house in Delaware with the proceeds. On the other hand, the western half of the county languishes and Seaford may be the poster child for those doldrums as it’s littered with older housing stock and vacant storefronts throughout the city. While the population has increased by about 25% over the last 25 years (from 5,700 to the latest estimate of around 7,700) its growth is well off the pace of Sussex County as a whole, which has nearly doubled in that timespan. So adopting right-to-work isn’t really going to affect the beachfront areas where the jobs are primarily retail, health care, or other service positions. But in those areas along the U.S. 13 corridor (in order from the Maryland line: Delmar, Laurel, Seaford, Bridgeville, and Greenwood) that have some infrastructure in place for new manufacturing facilities, this could be the economic shot in the arm they need to tip the scales their way. And you can bet your bottom dollar that, if this passes, Big Labor and their leftist allies will go running to the Delaware-based Clinton appointee who sits on the Third Circuit for a restraining order. While Mooney’s story notes a similar law has passed muster in the Sixth Circuit – which heard the case of a Kentucky county passing similar legislation – it’s much more of a crapshoot in the Third because most of its judges were appointed by Democrats and they tend to be more receptive to what passes for logic from the standpoint of Big Labor. This is a story that could be huge for local economic development, so it’s a head-scratcher that a Google search for news on “Delaware right to work” didn’t find anything aside from the story linked above. I guess they would rather find other controversy to discuss for the umpteenth time. So maybe my local friends have heard it here first. I have finally come around to the Delaware state races after speaking on Congressional races both in the First State and the First District of Maryland as well as the U.S. Senate race here in my adopted home state. Unlike Maryland, Delaware’s top two statewide offices are elected in separate ballots, meaning it’s theoretical that the governor represents a different party than his or her lieutenant governor. I will begin with the race for governor, which features four on the ballot and one write-in hopeful. As I have done previously, we’ll go in alphabetical order on the ballot which means the GOP standardbearer leads off. Key facts: Bonini has held elective office as a State Senator since 1994, which is the vast majority of his adult life as he first won at the age of 24. He also previously ran for state Treasurer in 2010, losing narrowly, so this is his second run statewide. Colin also works in the financial industry for a bonding agency and owns a small venture capital firm. Bonini is 46 years of age. Of the four on-ballot candidates for governor Bonini was the only one with a primary challenger, and he defeated Sussex County businesswoman Lacey Lafferty by a nearly 70-30 margin. Thoughts: In looking at Colin’s platform and some of what he is about, he strikes me as a relatively by-the-book conservative who wants to make government work better yet also has the potential of rightsizing government in a number of ways. Because of the nature of Delaware’s budget, Colin may have the better mindset for a potential pitfall to come based on a recent federal court decision regarding Delaware’s unclaimed property laws. Two definite items in his favor: an advocacy to make Delaware a right-to-work state and a pledge to pull Delaware out of the RGGI boondoggle – a step Larry Hogan should also be taking in Maryland to relieve pressure on state utilities. Key facts: Carney was supposed to be governor eight years ago (as the survivor of the Democrats’ primary is the odds-on favorite to win) but he was displaced in the primary by now-outgoing Governor Jack Markell. Carney was the favorite because he served eight years as the Lieutenant Governor under fellow Democrat Ruth Ann Minner, but voters rejected him in 2008. He’s also been the state Secretary of Finance and the deputy chief of staff for another former Democrat governor, Tom Carper. But when the Delaware Congressional seat opened up in 2010 because Mike Castle wanted to move up to the U.S. Senate, Carney was Johnny-on-the-spot and bucked the TEA Party trend sweeping the nation as one of just a handful of newly elected Democrats. Like many other Democrats running, Carney has spent practically his whole adult life in government, although he briefly served as the chief operating officer of a wind energy company during his downtime from being LG to winning the Congressional seat. Carney is 60 years old. Key issues: John’s “Vision for Delaware” includes sections on The Economy, Education, State Budget, The Environment, Healthcare, Criminal Justice, and Agriculture. Thoughts: Truth be told, his is not the worst, most liberal platform out there (although it definitely has its pitfalls.) But the overarching problem with state assistance in a number of areas is that it becomes state control rather quickly. Carney’s policies to me come off as Wilmington-centric, which addresses the population as currently comprised but fails to account for the growth area of the state, which would be Sussex County. (Kent County is also growing faster than the state average, which is held down by New Castle County and Wilmington.) It’s likely Carney would govern in the same manner that Jack Markell has done – business-friendly enough to please those interests, but liberal enough to keep the machine which has propped up his political career for most of the last 35 years backing him. Key facts: Goward is an Air Force veteran who made a lengthy career of it before retiring two years ago. Now he works as a railroad signal technician. Goward is 37 years old and making his first run for political office. Thoughts: Goward has some interesting ideas about the state of the state, but they seem to be lost when he makes civil liberties and criminal justice reform priorities over the economic issues people truly care about. I know that Libertarians are for smaller government, but where Goward fails in making the sell is relating the benefits of limited government to the voters of the state. It’s one thing to promise to cut spending in half in four years, but the reality of the situation would dictate a much less rapid winding down as well as an education course on why this would be a good thing. Also, Goward hasn’t updated his site since April so why should I take him seriously? Key facts: Like the other Delaware Greens, Groff doesn’t have a formal website. What I did find is that he is 58 years old, and while he’s not run for governor before he ran for the U.S. Senate seat in both 2014 and 2012 – the 2012 race was run with the additional blessing of the Delaware Libertarian Party. Key issues: From the limited reading I have, Groff is well entrenched with the Green Party line which would entail a much larger government. Thoughts: As a party, the Green Party barely made the 636 registered voter cutoff for ballot access this year. (As a comparison, Maryland has 8,614 registered Greens in a state about sevenfold Delaware’s population.) So it’s not like Groff will make a large dent, but the fact he’s not making it easy for people to learn about him makes things even more difficult. There is also one write-in candidate for governor by the name of Benjamin Hollinger, Sr. but I found nothing on him. So I will turn to the two LG candidates. Key facts: Perhaps he’s one of the few Republicans to be the head of a local NAACP chapter, as he leads the Dover chapter. Gunn ran for the Kent County Recorder of Deeds in 2014 and won the vote on election day by two votes, but four non-identical recounts later (two of which expanded Gunn’s lead and one that was a flat tie) it was deemed in court that the office was vacant, and Governor Jack Markell appointed his fellow Democrat. Gunn is a financial consultant by trade. Key issues: Placed under two non-specific categories, “Jobenomics” and Fighting for Delaware. Thoughts: Jobenomics is a carefully thought-out plan, but it’s way more complex than the average person wants to consider in a political context. If he could have boiled it down to a couple pages and related it to actual policy it may have been more helpful. As for the rest, it’s extremely skimpy. Granted, lieutenant governor may be a “bucket of warm spit” position (as evidenced by its vacancy over the last two years) but I think there needs to be more of an accessible platform for people to understand. Key facts: Hall-Long is one of the few Delaware candidates to be born in Sussex County, although she has spent the last 14 years in the state legislature representing portions of New Castle County. However, she spent several years outside the state, particularly in the Washington D.C. area (her husband was stationed in the Navy) and served as a Fellow in both the U.S. Senate and Department of Health and Human Services. She has a background in nursing, is 52 years old, and won a six-way primary for the LG nomination with just 29% of the vote. Thoughts: When I read the word “invest” four times in five paragraphs, I know I have to hold on to my wallet. Yet while Gunn is remarkably detailed in one area until one’s eyes glaze over, the platform of Hall-Long has the depth of a cookie sheet. And while I am not a grammar Nazi, I must say whoever wrote the copy for her website needs lessons in sentence structure. Again, there’s really not a great deal of function to the position but Hall-Long has some of the worst platitude speaking I’ve seen in this campaign. She may be a mom, a nurse, and a state senator but I have to wonder how much she knows about the role of government. As far as those I would recommend to Delaware voters, there are really two clear-cut choices here. Since Colin Bonini knows John Carney fairly well, he can keep John around as an advisor on business issues. But the more aggressive job creation approach from Bonini is the one Delaware needs right now. And having a laserlike focus on job creation isn’t the worst thing in the world for a lieutenant governor to have, either. Remember, I’m looking at this not as a voter (because I live in Maryland) but as one who wants the First State to succeed because my employment depends a lot on it. The more people find Delaware attractive, the better chance my employer succeeds. And I didn’t forget about Insurance Commissioner, but that balloting isn’t one that’s really important to me right now. So I have no opinion on it. 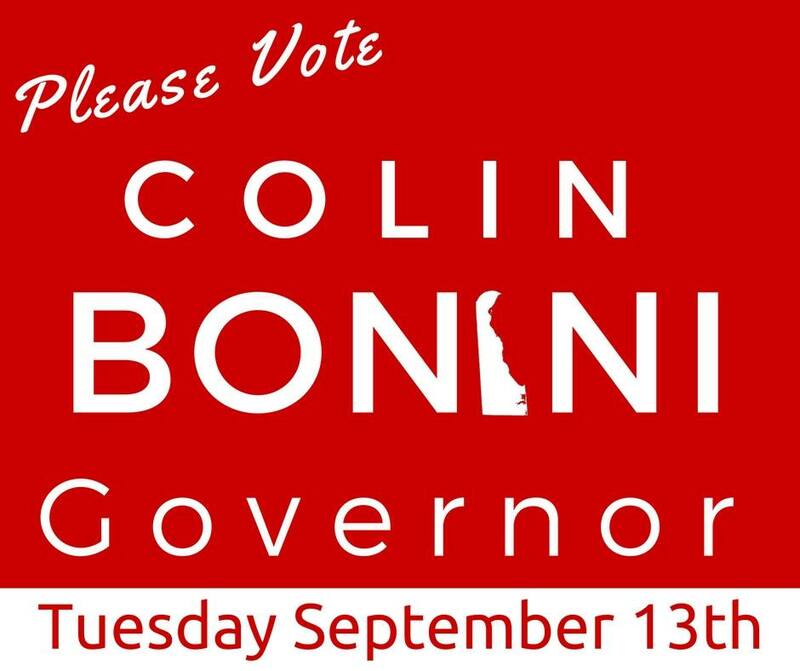 So if you are a Delaware voter, it’s in your best interest to vote for Colin Bonini and La Mar Gunn on Tuesday. They are clearly the better choices in their respective fields. I do not live in the First State of Delaware, but I work there as does my wife. So despite the fact I have no vote in the process, to me tomorrow’s primary is important enough to devote a post to. As originally intended, I had a pair of questions to ask of each of the four gubernatorial candidates regarding development and job creation that I sought their answer to so I e-mailed them to each candidate and listed it as a press inquiry. For the record, I only received a response from the campaign of Republican Colin Bonini asking for my phone number to do an interview. But I decided that wouldn’t be right to be that one-sided, nor am I a great fan of not having answers in writing. So this piece became more of a general overview. In a political sense, Delaware is a lot like Maryland: dominated by Democrats who live in one heavily-populated area of the state, while the downstate area is more Republican and conservative. To buttress that point, Democratic gubernatorial candidate (and current Congressman) John Carney was born and lives in the Wilmington area while the two Republicans facing off to oppose him, State Senator Colin Bonini and businesswoman Lacey Lafferty, live in Kent and Sussex counties, respectively. And in John Carney you also have a Ivy League liberal who’s been in government for most of his adult life as an appointee who moved up to Lieutenant Governor for two terms but was defeated in his effort to succeed his “boss” (in a manner of speaking, since the positions are elected separately in Delaware) in the 2008 Democratic primary by current Governor Jack Markell. Undaunted, John just waited until the opening came in 2010 to run for Congress since then-Rep. Mike Castle opted to run for the Senate seat that opened up when Joe Biden became Vice President. (The seat had a placeholder appointee until the 2010 election, which was to finish the last four years of Biden’s term. This was the primary Castle lost to Christine O’Donnell.) John Carney won the Delaware Congressional seat Castle was vacating and probably would have been happy to stay in Congress except that Joe Biden’s son Beau, who was the odds-on favorite to run for and win Delaware’s highest office in 2016, passed away from cancer last year. So Carney seems to be the recipient of the “Delaware Way” of particular officeholders cycling between political jobs. One thing I noticed in taking a cursory read of Carney’s campaign site: he uses the word “invest” a lot. Those in the know realize this means a LOT more government spending and that, to me, is bad for business. Higher taxes aren’t the way to attract the clientele that keeps my employer going, either. But the winner of the GOP primary faces the long odds of trying to overcome Carney, who has name recognition aplenty and will certainly be burning up our local airwaves in the next couple months since Salisbury (and Rehoboth Beach, where the local NBC affiliate’s broadcast orignates) is actually the TV market serving southern Delaware. It’s a contest between a man who has been in political office since 1994 (and was elected at the age of 24, meaning he has spent nearly half his life in office) and a woman who apparently began her run almost as soon as the votes were counted from the 2012 gubernatorial election. There are definitely some things to like about Colin Bonini: he has the good idea to make Delaware a right-to-work state and would encourage the streamlining of state government by offering longtime employees an early retirement package. Legislatively, he has ranked as the most conservative legislator in the Senate (although out of 21 that may not be the greatest achievement.) However, he has the luxury of running from cover as his legislative seat isn’t up for election this time and, quite frankly, this may not be the year for entrenched politicians on the Republican side. Sen. Bonini is the choice of the establishment, but Ms. Lafferty believes she will win. She’s been critical of her primary opponent, referring to him on Twitter as “lazy” and a “buffoon.” Sen. Bonini represents part of a failed political culture, Ms. Lafferty said, noting he did not officially unveil his campaign until recently. 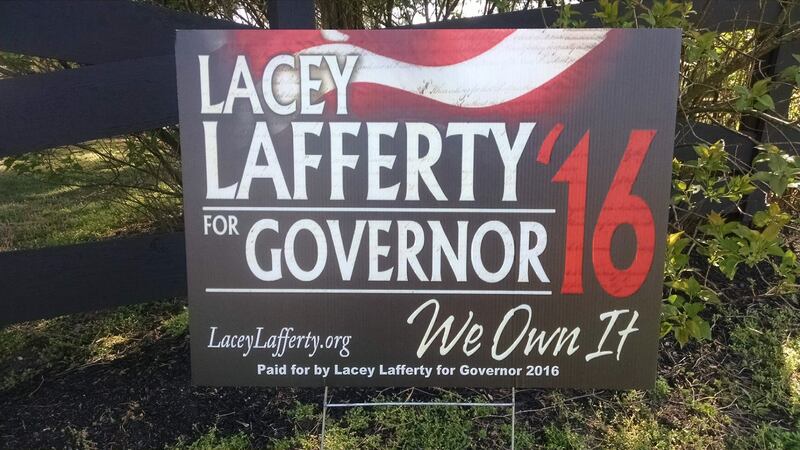 As of Aug. 14, he had about $66,000 on hand, while Ms. Lafferty had $4,400. Delaware State University professor Sam Hoff foresees Ms. Lafferty pulling in about 15 percent of the primary vote, largely from more left-leaning Republicans. Apparently there aren’t a lot of polls done in Delaware, but the poll I did find has the race at 29-22 Bonini. And since I have heard Lafferty identify with Trump on several occasions, I don’t think she would be t he choice of “left-leaning” Republicans. I have to give credit to Lafferty for working hard to build a grassroots campaign, with the best philosophical idea I noted from her being that of stressing vocational education. I agree that not all students are college material, but those who can work with their hands and aren’t afraid of a little effort can succeed quite well in life. She has quite the distinctive yard signs, too. (Don Murphy would hate them but you have to admit they are artistic.) And I see quite a few of them driving around Sussex County. So Republican voters of Delaware have an interesting choice to make tomorrow for governor. They can pick the candidate who has lots of experience in lawmaking and owns a very conservative voting record; someone who is likely perceived as the safe choice but may not have the appeal for people to cross party lines. Or they can select someone who is, to be honest, more of a wild card. We have no idea whether she will be polished on the stump or self-destruct when the people begin to pay attention. It’s possible she was a tough-talking conservative the entire campaign but finds out there’s not the waste, fraud, and abuse she thinks there is in state government – not to mention has to deal with Bonini as a state senator who would have to push her agenda. I would be remiss if I didn’t note there will be other candidates on the November gubernatorial ballot, including Libertarian Sean Goward – who may be hoping for a boost from the national ticket with Gary Johnson polling in the high single digits. Goward hasn’t been one to update his website much, though. On the other hand, the contest for Lieutenant Governor is solely on the Democratic side, as La Mar Gunn is the only GOP stalwart to run. (He’s best known for “losing” the Kent County Recorder of Deeds race in 2014 by two votes – the first recount that the Democratic incumbent Betty McKenna won after Gunn won on Election Day by two votes and won two recounts by similar – but not those exact – margins.) Between the six candidates on the Democratic ballot (Sherry Dorsey Walker, Brad Eaby, Greg Fuller, Bethany Hall-Long, Kathy McGuiness, and Ciro Poppiti) you find varying levels of political experience but more or less the same amount of liberalism – basically peas in a pod. There’s also a Congressional race with one Republican (Hans Reigle), one Libertarian (Scott Gesty), and (again) six Democrats – Sean Barney, Mike Miller, Lisa Blunt Rochester, Bryan Townsend, Scott Walker, and Elias Weir. In looking through their positions, this November you can decide between Reigle, who seems to me a right-of-center sort who would probably fall midway between the most conservative and liberal Republicans in Congress, the fairly classic small-government, non-interventionist Libertarian Gesty, and the Democrat who will be way left of center whoever he or she is. Again, peas in a pod. Unlike Maryland politics, I look at the situation in Delaware as an interested observer rather than an erstwhile participant because, as I said up top, I work in the state. But as one who lives across the Transpeninsular Line I think I speak for the people of Delaware who want their state to succeed. Above all, I want it to be attractive to new residents and prosperous for those already there because that helps to make my paycheck, so vote wisely in the primary. In the wake of the successful Brexit vote I knew someone would resurrect this old idea. Certainly the idea of the state of Delmarva (or as I would call it, the state of Chesapeake) has been around for generations. It’s only natural given the geographic isolation both the Chesapeake and Delaware bays provide, but reality’s heavy thud divided this sandbar somewhat unevenly into one full state and parts of two others. The full state is one of the smallest in the country by both population and geography while the states split by Chesapeake Bay have practically all of their population across the Bay – less than 10% of Maryland residents and barely 1/2% of Virginia residents live on this side. Yet if there were a referendum on the subject, we would have a plethora of possible choices, with perhaps the top three being: one new state for the entire peninsula with a brand new slate of laws, the merger of the Eastern Shore portions of Maryland and Virginia into a greater state of Delaware, or remaining as we are. Perhaps Wilmington and New Castle County of Delaware may feel better with a more urban state like New Jersey. But then what happens to institutions like the University of Delaware, which is in New Castle County? Obviously the politician in me likes the idea of a greater Delaware that would become a “purple” state where Republicans have a good shot of taking control. Since New Castle County boasts a population of 556,779 (according to the latest estimate) out of a state that has 945,934 (based on that same data) it’s always going to run the state of Delaware. (If you think Maryland is bad, remember no jurisdiction has more than 15% of its population. New Castle County is over half of Delaware’s.) Adding the Eastern Shore of Maryland and Virginia would basically negate the Democratic-leaning population of New Castle with a broad area nearly equal in population but definitely more conservative-leaning. Yet even if we can’t be part of Delaware, there are a number of things that can be done to bring us closer. My favorite (and this has been tried before) is to eliminate the sales tax from Eastern Shore counties in Maryland. (The same could be done in Virginia, although being separated by about 40 miles of Maryland makes the “Del” and “Va” a less likely pair of rivals.) Creating a business zone based on Delaware laws as applicable for the Eastern Shore could be of assistance as well. But while this idea has plenty of benefits, it probably won’t happen in my lifetime because political power is more important than the people, It’s still a shock to me that the people of Great Britain were allowed such a referendum in the first place – obviously the liberal EU assumed everyone loved them. I expected a result more like the bid to split California up into six states, which failed to qualify for this year’s ballot. The last state to be split up was when the Union-leaning western part of Virginia seceded from the Confederate state of Virginia in 1863 – Virginia was eventually readmitted but not reunited with its former territory, which is now West Virginia. To create a new state or expand Delaware it would take the approval of all parties involved and that’s not going to happen because they need our money – and when it comes to politics we know they follow the golden rule: he who has the gold, rules. It is nice to dream, though.